It is tough for me to stay away from baking.Fortunately,I am lucky to share my baked goodies with friends,which is the sole reason and inspiration for me to bake more and more.Imagine sitting with a huge cake and no one to share it with,of course I do get greedy at times and wished it was a possibility but sanity prevails. Off late I haven't been baking much.In fact I scratched my brains and figured that it's been one whole month of not baking.Blasphemy,right?I decided I am baking something definitely today.Was not in the mood for an elaborate bake as I didn't want anything to to put me off.Almost decided on this,but was out of Nutella so decided on this super simple,quick and delicious 2 minute Brownie. 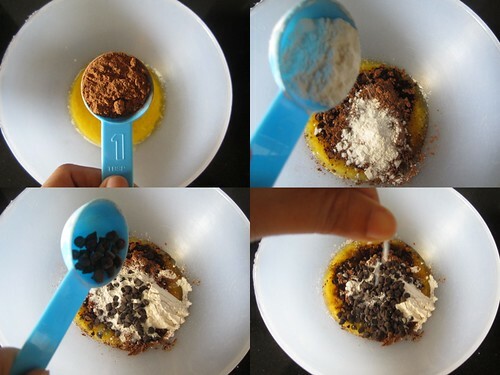 All it takes is less than 3 minutes,to assemble,mix and bake.Isn't that amazing?Dangerous even. 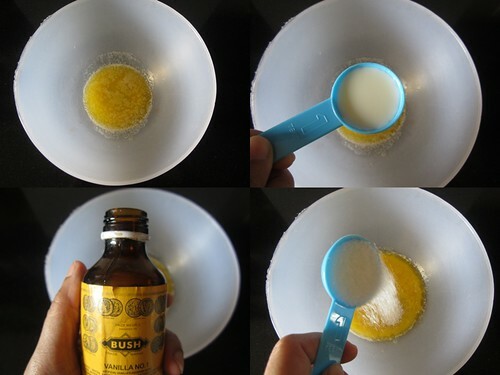 In a bowl,mix together all the ingredients and make a batter. Pour the prepared batter into a Microwave safe dish,I used 2 ramekins. Microwave at full power for 1 minute and 30 seconds.Let it rest for another 2 minutes. Looks gr8,thks for dis easy recipe! Wowo that looks super fast and egg less too. I think this is something I will try, sometimes i want to have something sweet that i tend to go to the kitchn and take chocolate, but this is more exciting to do. Sure will give it a try soon. Prefect for sudden craving. 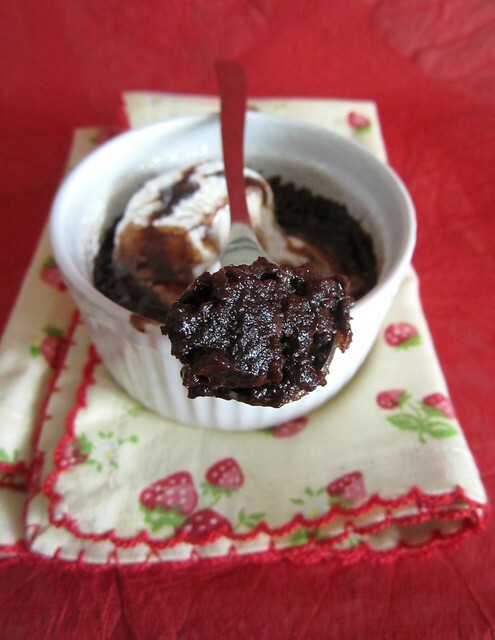 Quick and droolworthy brownie. 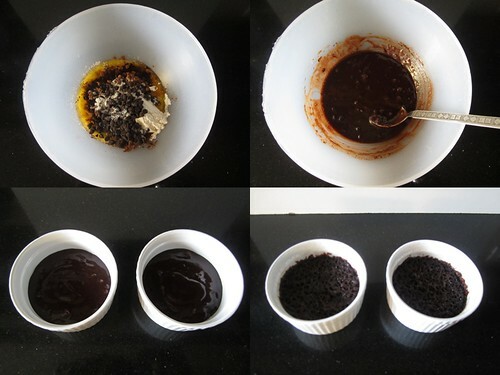 Divya, This loos so good...I also have a mug cake recipe that I use so often ;) Yours definitely looks more chocolaty - YUM!!! That is amazing. Divya do you know that your blog is listed at Haaram.com Check. Many of us have put blog posts asking them to stop linking our sites. I saw it Bhagyashree,have no clue what to do about it! Hahha I can relate, I've always wanted to sit down with an entire cake, and just attack at it with a fork. Thankfully, that hasn't ever happened! Sharing, and people complimenting it makes my day. These brownies look great, and so so bad for my diet! I am guessing the brownie might have got overcooked.When you bake in a microwave and it gets overcooked,the end product can become hard.Try baking it for a lesser amount of time.Probably 1 minute and then let it rest for 2 minutes. 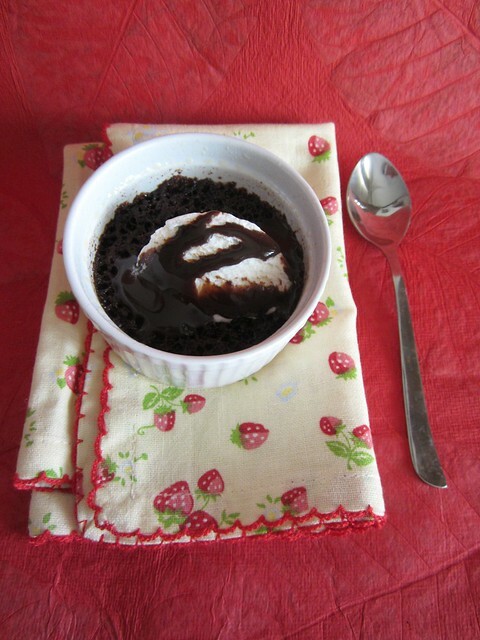 Hey Divya, want to surprise hubby with this wonderful recipe. Can u tell me the flour used - is it maida (plain flour) or atta (wheat flour)? I've used all purpose flour/maida. I must say that this the most amazing recipe I've come across...made in 10 minutes and eaten in 2 !! Thanks a to for posting this....made it yesterday and it turned out to be superb !! Overcooked... now so crispy I can't even chew properly and use a spoon. I'm sorry it didn't work out for you. These brownies taste so good! They are so easy to make, and the end result is fabulous. Thanks for sharing the recipe! Made two; one cooked perfectly, the other, I don't even know what happened. Hardened to the spoon, butter separated from burnt chocolate mess. My little sister is enjoying a brownie while I'm stuck trying to wash up hard molten brownie. Not very reliable, sorry. Absolutely loved. Honestly, I put everything in a mug, stirred, & popped it all in the microwave for 90 seconds on high. Let it sit for two minutes, as you said & it was awesome. We tried it with marshmallows, a bit to sweet. Thank you for such a good recipe. Can we microwave two - three cups at one time? ?